Terry oversees the recycling of everything from cardboard and plastic, to lawnmowers and bikes. This recycling center does it all and has the whole county behind them. The Winneshiek County Recycling staff are not the only ones who are focused on the end result. 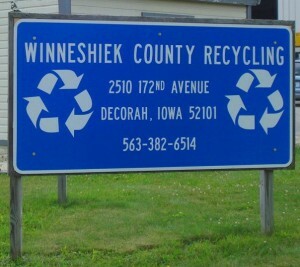 The local community of Winneshiek County, Iowa, seems to be very engaged and on-board with the recycling initiatives. With a population in Winneshiek County of 21,000 mostly environmentally-conscious citizens, the people are key to making the recycling program so successful. Terry gives the citizens’ credit, “Our participation rate is very high. The operational structure we have lets the taxpayers of Winneshiek County benefit from participating in the recycling program.” It is easy to tell how well the recycling center and the citizens work together through education on the Winneshiek County Recycling Facebook Page. As a recycling center that is well known for its high quality materials, Winneshiek County gets the best pricing anywhere. Terry is always watching the paper, plastic, metal, and textile markets to stay on top of the pricing for materials that can be moved around in the recycling world. The Harmony Baler that they have now is dedicated to High Density Polyethylene, also known as the items identified with the #2 recycling symbol. 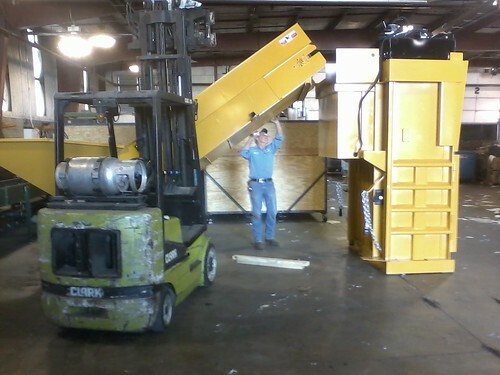 WCR plans on purchasing another baler in the near future to dedicate it to #1 PET plastic. Terry has advice for others who are considering the purchase of a baler to help them improve their operating efficiencies. Terry recommends, “Determine what your slowest process in your facility is and find the unit from Harmony that will help correct the problem. Your overall rate of output in your facility can only be as fast as your slowest process.” – Great advice that will help create a greener environment, greener revenues, and sustainability for anyone who is in a recycling facility.